What Watership Down Merchandise do you have? I own a piece of rare WSD merchandise that hasn't been mentioned yet. I don't think even Hyzenthlay owns it. Its a 300 piece jigsaw puzzle of the 1978 film, made the same year. The box is a little worn but other than that, all the pieces are there. I'll post a picture of it when I get home in a couple days. If anyone can find this, I will pay top price for it, and if you can get it for me and then ship it to the USA for me, I can pay you ASAP through Paypal. This is one 1978 item that keeps eluding me! You can PM me or e mail me anytime if you find it. I am really looking for this. ALSO: to complete my Royal Orleans figurines, I need CAPTAIN CAMPION and PIPKIN. all have fabulous collections, I hope you never have the need to sell. My collection is set to be always seen proudly for me. Someday I'll find a professional stuffed animals to make Hazel And Silverweed. Favorites rabbits. The interesting this is, I got that very rare set of four plushies * the ones from the UK* from someone who really desperately needed the money. That set of plushies is the centerpiece of my collection...as I have never been able to find those ever again, anywhere. Wow, lots of cool items! I never knew there were soft toys from the film - nor the figurines at that. When this movie came out in 1978, movies in general in the USA were not as marketed as greatly and heavily as they are now. Now, I suspect they would have lots more items. On the other hand, WSD was not exclusively a children's movie. In the USA they marketed it wrongly as a kid's film when it was to me, a family film. I've seen some on Ebay in previous months, last year I was going to buy one myself but I thought I'd save my money for other things. If one comes on again, I can always buy it for you and ship it to the USA, I've done it before with other things, so I don't mind!! I'll write it down on my stickynotes so it's there to remind me. Also which kind of Bigwig plushie are you looking for? Series or movie? The gal with the goods! Thank you for the offer, I really appreciate it. I was bummed out not being able to have it shipped. It seems as though the WSD 1978 collectibles come out on EBAY in bunches. For almost 18 months now I have seen very little if not NOTHING of the things I need to complete my 1978 collection. BUT!!!! Shortly after I signed off on this site...I went to UK EBAY and found someone who did indeed ship to the US. It was kind of pricey but I got the puzzle...AND I also found someone in the USA who was selling all her Royal Orleans pieces...so I bid on PIPKIN and CAPTAIN CAMPION, the two figurines I need to complete the collection of 12! * Also, Thlayli, I should have mentioned I'd pay 20 dollars US as a finder's fee and a thank you if you ever do find something I need and ship it here, in addition of course to shipping and handling. Bigwig plushie is the very rare 1978 one...made in Canada...only the movie one. No worries! I'm glad you've got them! I'm so tempted to collect the royal orleans figures but I'm suposed to be saving up for a car lol. I want to collect the plates too. I really like the plates too! But I would worry that they would break as I have no safe enough place to keep something that breakable. HI. I am trying to purchase the last three TV series Enecsco figures (Hazel, Dentilion, General Woundwort) missing from my collection. If someone can tell me where i can order/obtain them,i would be gratefull. I don't have that info for you, Ulysses, but welcome to the forum! Feel free to introduce yourself here: http://fhc.soopergrape.com/index.php?board=13.0 or reach out if you have other questions. Dont know if this counts as Merchandise, but I just ordered personalized license plates for my car from Motor Vehicles. They will say HRUDUDU. Should have them in 8 to 10 weeks. Im so excited!! You can get the plates for pretty reasonable prices. 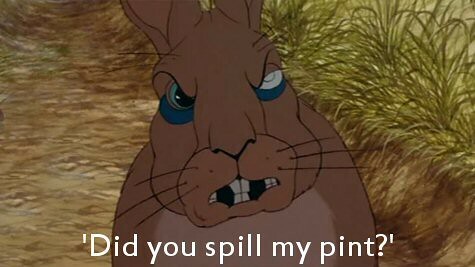 Re: What Watership Down Merchandise do you have? I've seen pitures of the collectible plates but never saw them for sale. I got a fiver tv plush and a 1980 Hazel last year. Movie Merchandise has been harder to find lately.